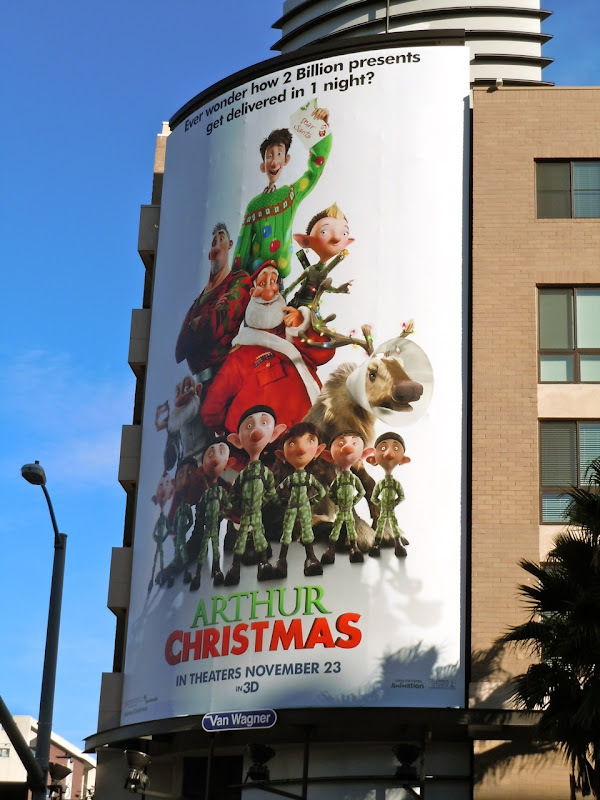 November has certainly seen a huge Arthur Christmas billboard blitz around the streets of L.A. and in New York, but they've actually gone one step further along Sunset Boulevard in West Hollywood and they have a living human billboard installation. How fun is this interactive PR stunt? 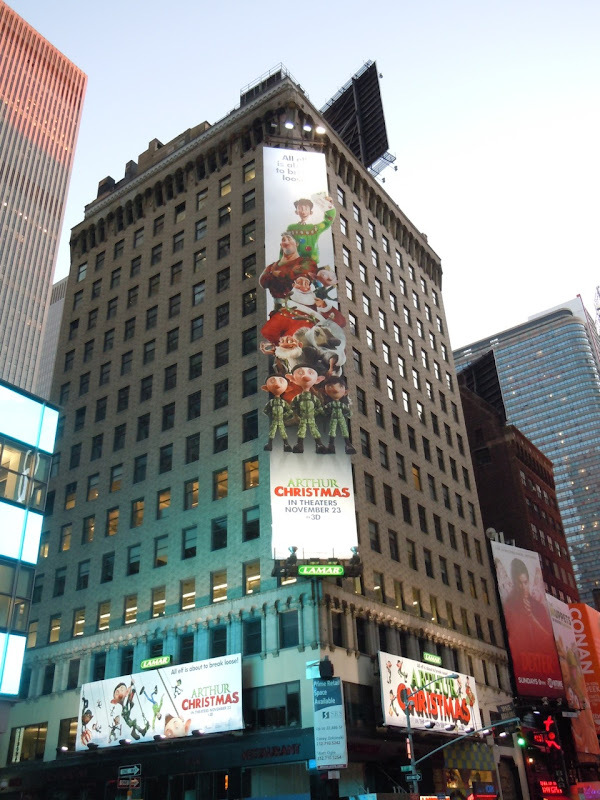 Not only do they have an actual 'Arthur' lookalike answering phone calls and waving to passersby up on the billboard platform, but they also have Santa's elves wishing everyone a Merry Christmas at street level. This fantastic installation looks like it's all for a good cause too, not only is it promoting the new festive film, but it appears to be encouraging gift donations for the U.S. Marine Corps Toys for Tots Foundation, which collects Christmas presents to give less fortunate children in America over the holidays. 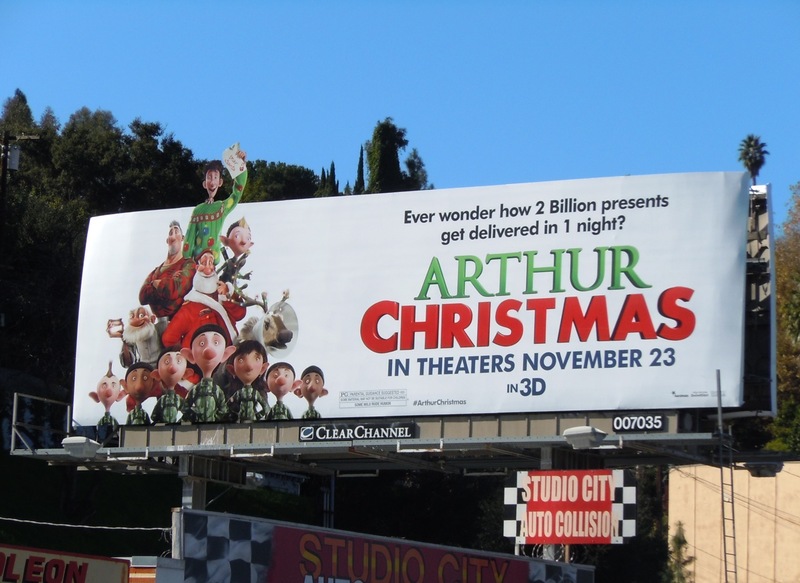 They've even gone the extra mile and gift-wrapped the billboard pole which is a nice touch. 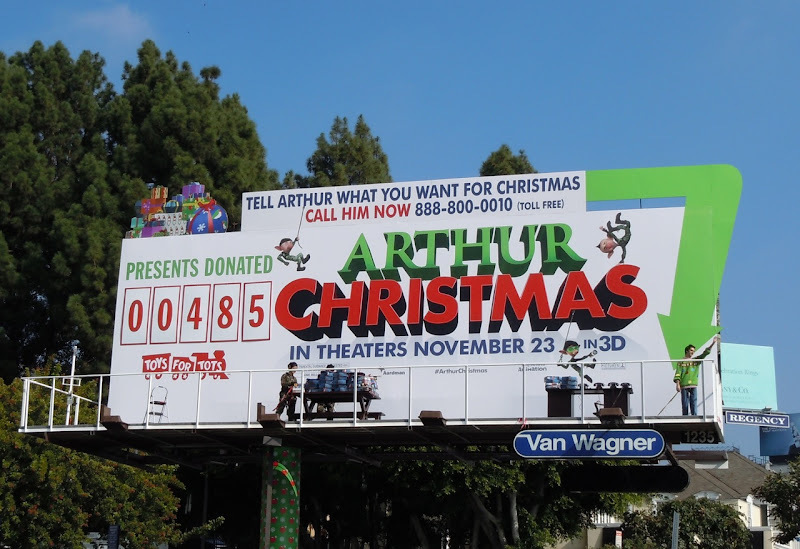 These photos were snapped near the start of the campaign on November 15, and let's hope that 'presents donated' count reaches a blockbuster total by the time the film opens in cinemas. 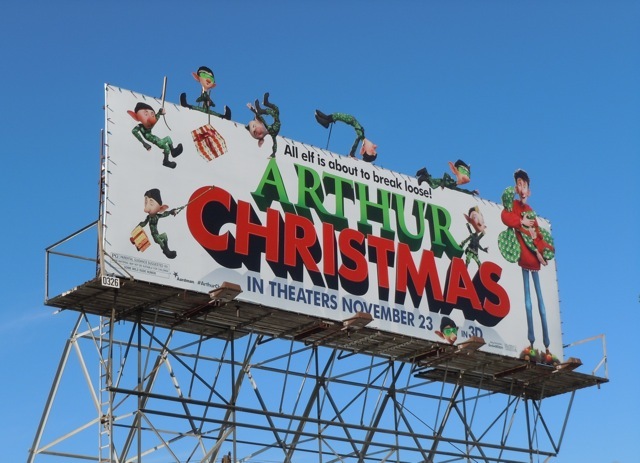 Aside from this live-action billboard, there's also a wealth of other eye-catching Arthur Christmas billboards to be seen at the moment. 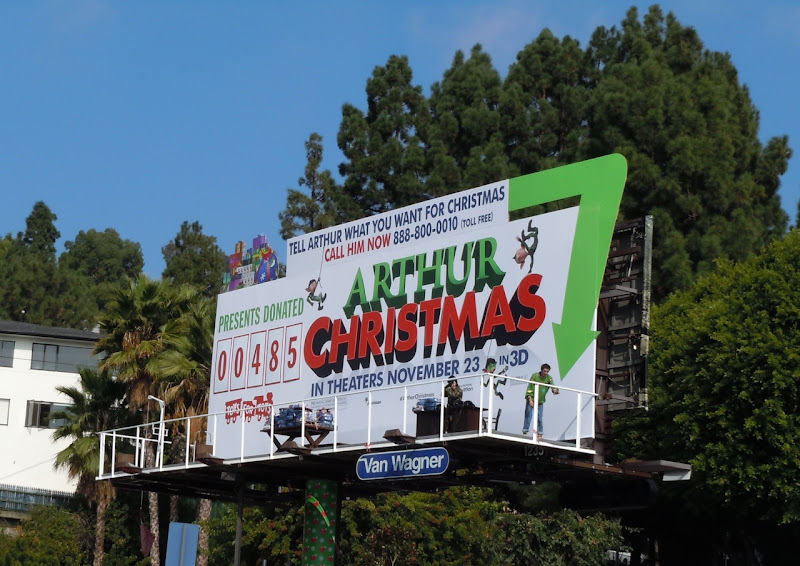 It's always a little strange to see Christmas themed billboards so early in sunny Los Angeles, the festive creatives always a little out of place against blues skies and blazing sunshine. 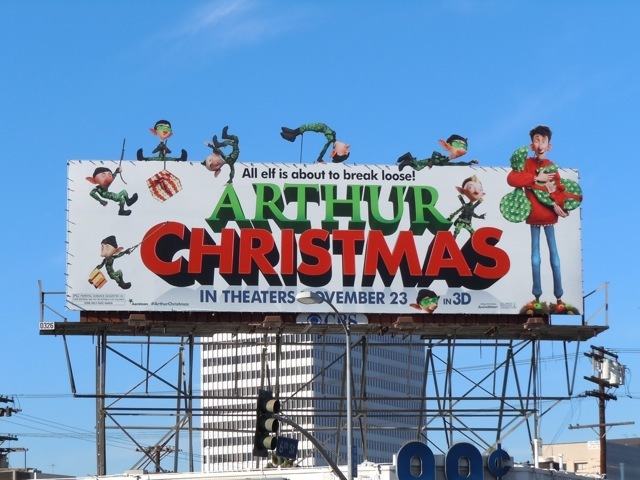 However, these are such fun and colourful billboards that you can forgive their early start to the holidays. 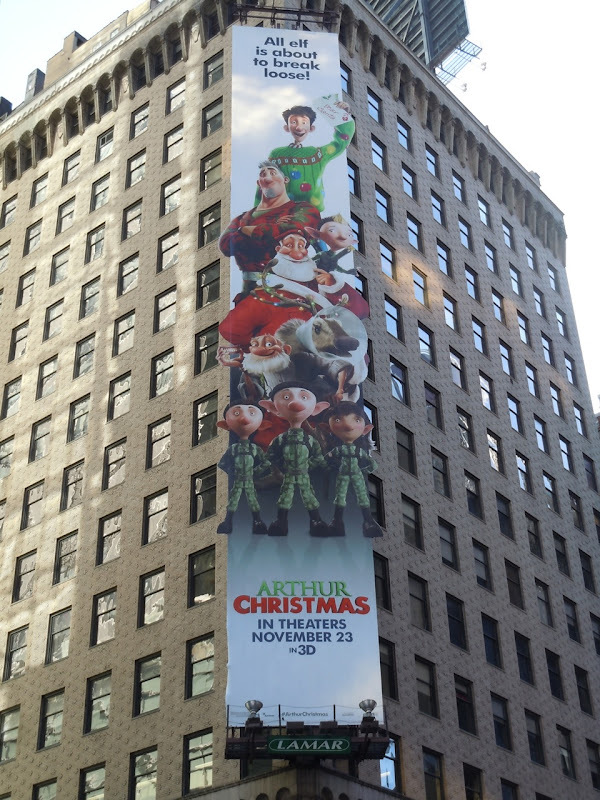 Meanwhile, this special trio of billboards for the movie was snapped near New York's Times Square on November 5. The computer-animated movie from Aardman Animations (the stop-motion clay animation geniuses behind the likes of Wallace & Gromit and Chicken Run) follows the adventures of Santa's son 'Arthur' in the North Pole as he embarks on an important mission before Christmas morning. 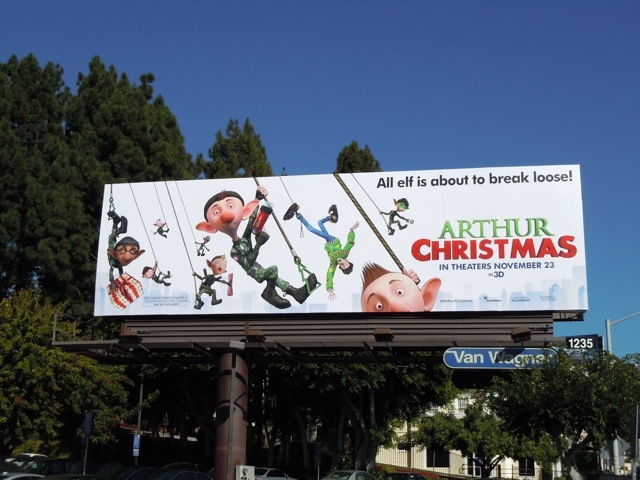 As a nice touch, the billboard with all the special extension acrobatic elves even has Christmas tree lights around its border and was snapped along Fairfax Avenue at 6th Street on October 29. 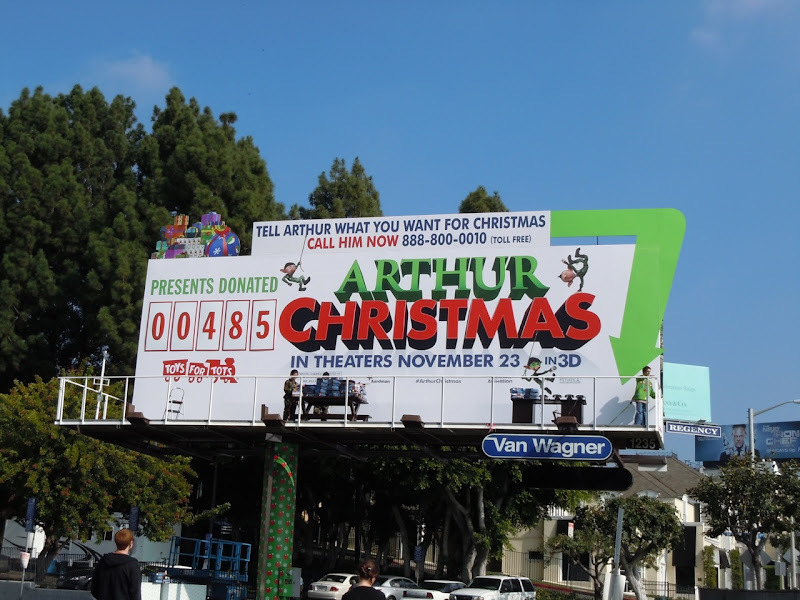 The large format '2 Billion presents' billboard was captured along Highland Avenue in Hollywood on November 14, whilst the other creative with the elves swinging on cables was photographed along Sunset Boulevard on November 2, 2011 (which was replaced by the live charity installation). 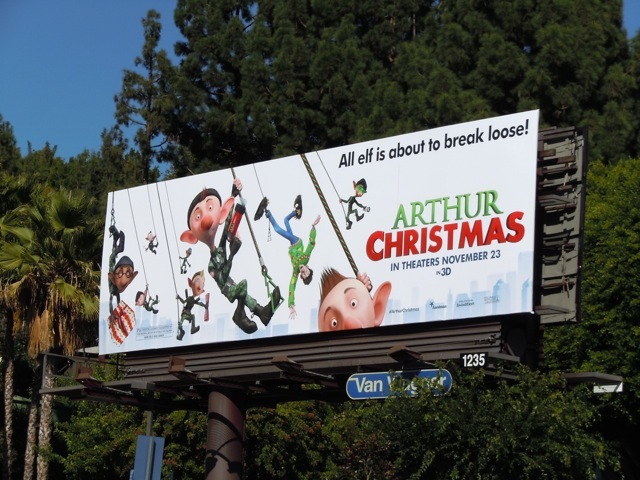 UPDATED: Here's another special extension ad for Arthur Christmas spied along Ventura Boulevard in Studio City on December 5, 2011. 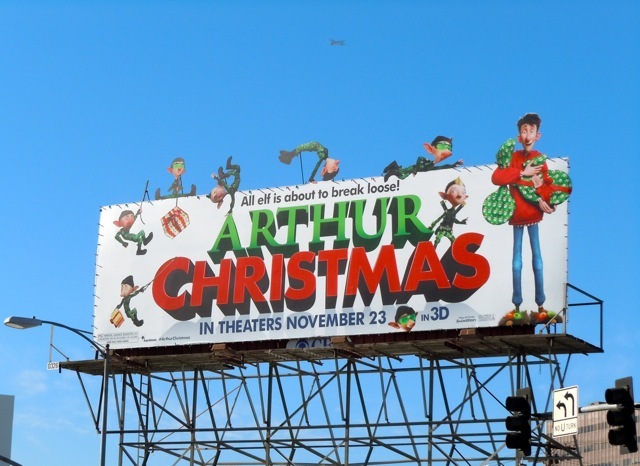 They certainly spent a lot of money on eye-catching billboards for this seasonal movie.